Volume control. Unlike passive volume controls which decrease the volume by shorting some of the signal to ground, causing degradation in tone, the active volume control on the ZP3 allows the volume to be set to any level without overall loss of highs or tonal change. Play a note, let it ring while slowly turning this control up and down, you’ll hear no change in tone. Pickup blend control. Buffered inputs provide exacting control over blending the neck and bridge magnetic pickups. This feature allows even the most subtle blend, for a greater variety of tone. Turning the control clockwise brings in the bridge pickup. Turning the control counterclockwise brings in the neck pickup. The detent, or “click,” in the center of the control is the point where both pickups are on equally. Bass control. 15dB boost or cut of bass at a center frequency of 30Hz. Turning the control clockwise boosts the bass. Turning the control counterclockwise cuts the bass. The detent, or “click,” in the center of the control is the “flat” position, zero boost or cut. Treble control. 15dB boost or cut of treble at a center frequency determined by the switch selection. Turning the control clockwise boosts the treble. Turning the control counterclockwise cuts the treble. The detent, or “click,” in the center of the control is the “flat” position, zero boost or cut. 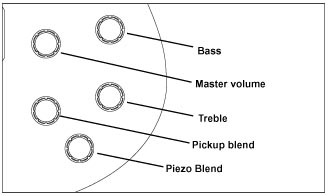 Piezo blend control. Provides the ability to continuously blend the signal from piezo bridge and the magnetic pickups. 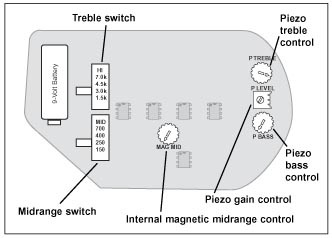 Turning the control clockwise alters the balance between piezo and magnetic pickups by emphasizing the magnetic signal while de-emphasizing the piezo. Turning the control counterclockwise de-emphasizes the magnetic pickups while emphasizing the piezo. The following controls are located inside the bass’ control cavity. You will need to remove the rear cover plate to adjust them. Midrange switch. Select from 150 Hz, 250 Hz, 400 Hz, or 700 Hz as the center frequency from which to boost or cut. High frequency switch. Select from 1.5kHz, 3.0kHz, 4.5kHz, or 7.0kHz as the center frequency from which to boost or cut. Midrange control. 15dB boost or cut of midrange at a center frequency selected by the midrange switch position. Turning the control clockwise boosts the mids. Turning the control counterclockwise cuts the mids. The midpoint in the control’s sweep is the “flat” position, zero boost or cut. P level. Piezo gain control. Turn control up or down to adjust the ratio of piezo output to magnetic output. P bass. Bass gain control. Turning the control clockwise increases bass, turning the control counterclockwise decreases bass. P treble. Treble gain control. Turning the control clockwise increases treble, turning the control counterclockwise decreases treble.